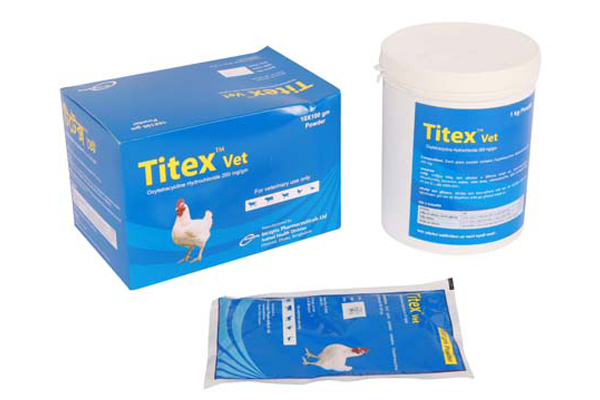 Titex Vet powder: Each gram Powder contains Oxytetracycline Hydrochloride BP 200 mg.
Oxytetracycline is one type of proven broad spectrum antibiotic that is used in infectious diseases of domesticated animal and poultry. Oxytetracycline is prepared for oral, uterus use, water, feed and injection use. Oxytetracycline inhibits bacterial protein synthesis. Poultry: To prevent and treat different poultry diseases eg. Salmonellosis, Colibacillosis, Infectious Coryza, Fowl Cholera, Mycoplasmosis, Chronic Respiratory Diseases (CRD) and Coccidiosis. Oxytetracycline is generally safe and effective but Oxytetracycline and other tetracyclines are cause of the teeth discoloration or decaying teeth in young animals. No significant precaution is needed during use.